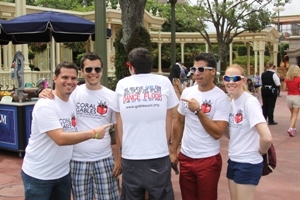 FFA - Gay Day at Disney 2013 report – Gay Day awareness campaign was a remarkable success. 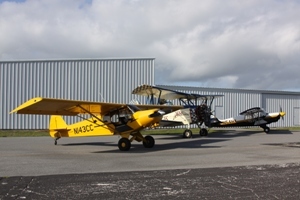 Florida Family Association flew three aircraft all day Friday, May 31st and from 7:30 am to 1:00 pm on Saturday, June 1st to warn potential patrons about Gay Day at Disney which was held on Saturday. The primary objective of this project is to warn families before they expose their children to Gay Day’s revelry and before they pay Disney for parking and admission. Photographs taken of the event are posted below. Overall attendance increased approximately 25% over 2012. 2012 attendance was the smallest in several years. Overall attendance was still significantly lower than what it should have been on the first Saturday of Summer. Attendance should have been another 25,000 to 30,000. 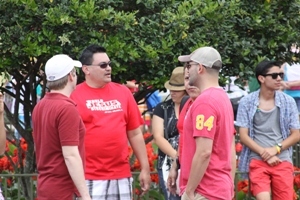 Gay Day patrons, those attending Disney for the Gay Day event, came out in mass numbers unlike the 60% drop reported by Florida Family Association for 2012. The increase in Gay Day Patrons easily accounted for half of the increase in overall attendance. There appeared to be a strong organized push by various groups to show their support for this event in light of Florida Family Association’s prominent aerial opposition. Rain on Thursday and early morning Friday most likely delayed some visitors’ attendance until Saturday and contributed to the increased attendance. Approximately 1,250 people left the park each hour beginning at 11:00 am. 95% of the people leaving the park so early were families with children. Perhaps they did not have choice with two bad days of weather, or did not see the warning banners or simply thought the event would be tolerable. 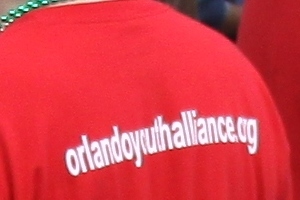 Florida Family Association’s primary objective in this project was to warn families before they expose their children to Gay Day’s revelry not to stop Gay Day patrons from attending their event. 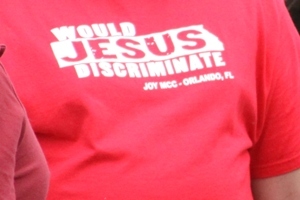 Even though the banners motivated opposition attendance, Florida Family Association knows from the low overall attendance at Gay Day 2013 that thousands of families heeded the warning. Subject: New message for Florida Family: sent by K.S. We are staying at the __ __ hotel right now. 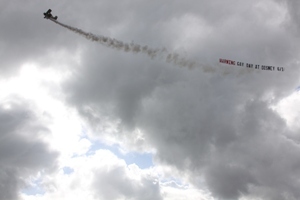 Thank God we looked up and saw your banner! Our children are 8 and 10, they go to a private Christian school. They are beautiful, innocent children and we are so appreciative you warned us! It's so sad that we paid a lot of money to be here and we can't go to a Disney park tomorrow. God Bless you and thank you again. 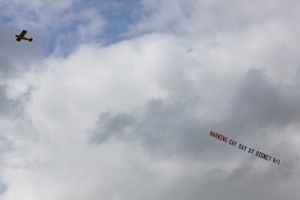 I just wanted to say thank you for the banner that was flown today advising of the gay day event. I had planned to take my family, which includes my young children, to Disney but we are making alternate plans. I'm sure it has not been easy taking this public stance, but I for one appreciate the information you are sharing. While I don't mind the decisions people choose for themselves, I do not feel an organized event such as this where young children will be exposed to who knows what is appropriate. Subject: Re: Florida Family Association will warn tens of thousands of families about Gay Day at Disney with two aircraft banners. I took my kids to Disney World from the 26th of May to the 1st of June for Star Wars Weekends. By Thursday the 30th of May, the presence of these now openly UN-natural individuals was noticeable. By Friday, it was even more noticeable. 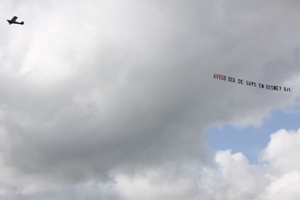 Florida Family Association also received many, many emails, texts and phone calls from Gay Day proponents that expressed their angst toward the aircraft banner project. 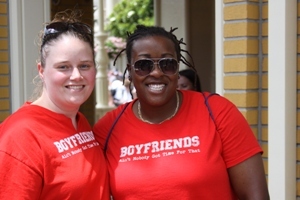 Other observations indicate that Disney is more and more involved in Gay Day than ever before. WARNING: Some of these photos may be offensive. 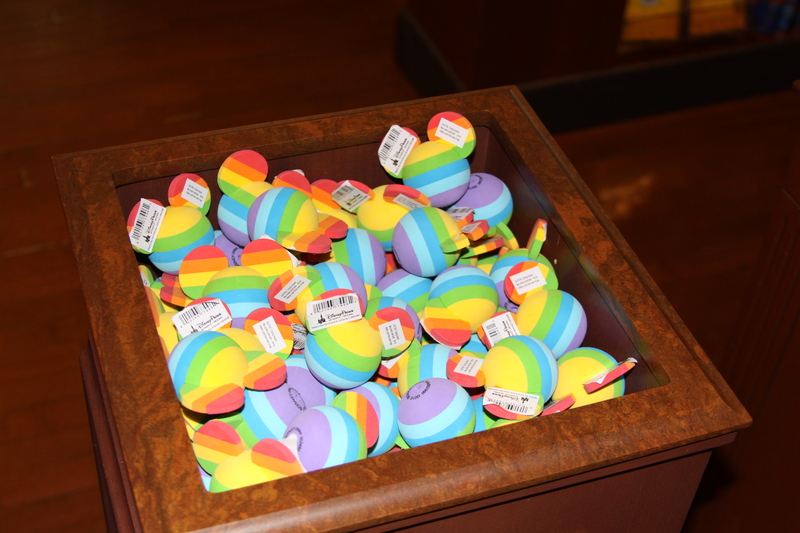 Disney designed rainbow souvenirs for the Gay Day patrons. The Orlando Sentinel reports “'Rainbow Mickey' souvenirs come out for Gay Days. Earlier this week, Disney began to sprinkle merchandise throughout its parks with designs including rainbows, symbol of the gay-pride movement. 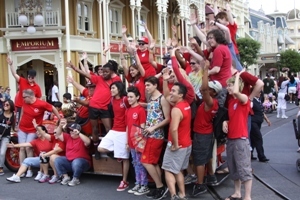 Red tank tops with rainbow-colored Mickey Mouse heads began arriving in shops along Main Street USA a few days ago. They were paired in store displays with other rainbow items usually found in the parks year-round, such as rainbow pins and antenna toppers." The Disney owned Buena Vista Palace was taken over by Gay Day patrons without notice to regular visitors. According to personnel at the front desk of the Buena Vista Palace Gay Day patrons “purchased the Buena Vista Palace pool for Friday, May 31, 2013. The pool was closed to regular guests unless they paid $35 to attend” the debauchery. Guests were NOT informed that management was closing the pool for the homosexual party nor were they informed that approximately NINETY FIVE PERCENT of the guests were homosexuals that intended to own significant amenities for their party. 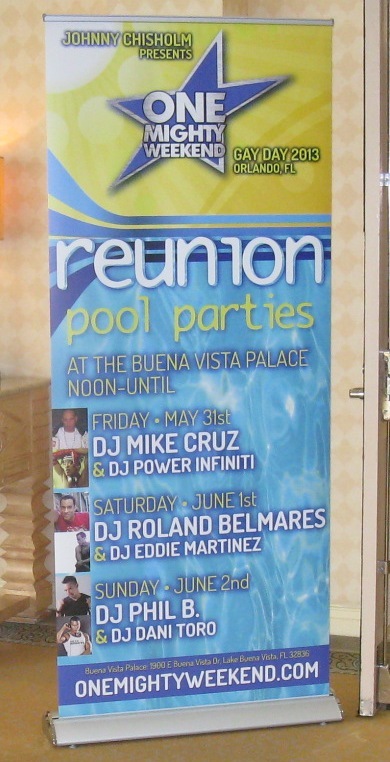 Gay Day promoters posted a sign (left photo) in front of one of the Buena Vista Palace convention rooms where tickets were sold for the pool party. Photo to the right shows the box that was in front of the pool entrance (photo below) where tickets to the Gay Day event were collected. What else needs to be said that this photo doesn't already say about Disney's Typhoon Lagoon water park being advertised in this manner? 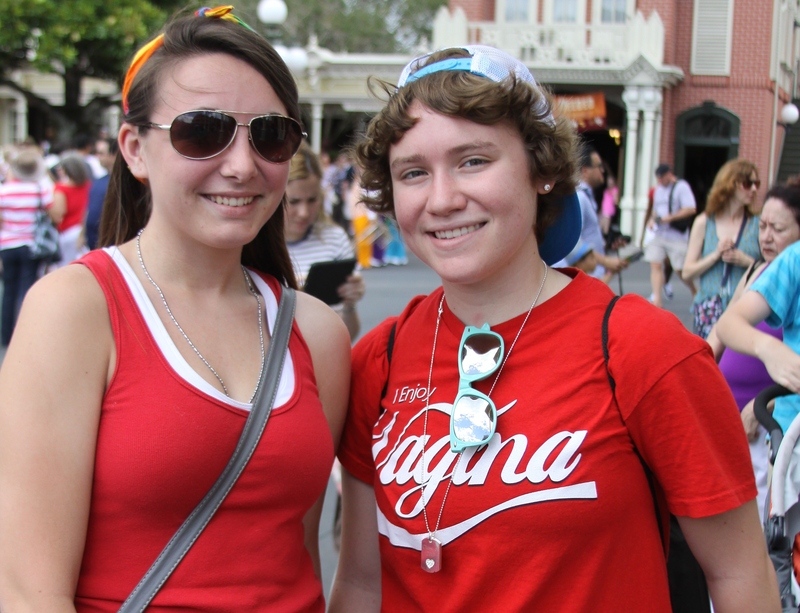 Some Gay Day at Disney 2013 photographs. A BIG THANK YOU to everyone who supported this project.